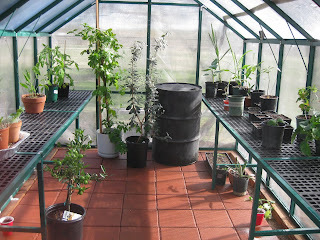 For those of you with a green thumb wanting to grow even during the winter, a greenhouse is the prefect solution. As for me, I am more interested in growing exotic tropicals all year round. What ever the case may be, greenhouses can be a lot of fun. So you might ask what more is there to a greenhouse than parts and a manual? Well for one, you are not restricted to buying the common "snap together" greenhouses. Many people opt to build their own from scratch, buy more complicated blueprints/kits, or even contract builders to do the work for them. There are many advantages to buying one of these cheaper snap together greenhouses, however there are also many limitations. *There are some greenhouse kits that are by no means cheap, some are even fitted with electricity, lighting, heaters, coolers, thermostats, the works. 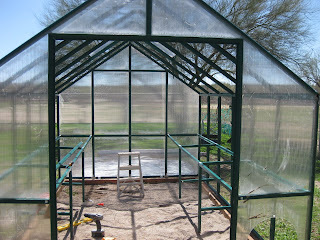 The greenhouse we built was an 8 ft. by 12 ft. "EZgrow/Kensington" brand greenhouse. The kit arrived in three very large boxes with a total weight of over 250 pounds. While the finished product seems pretty sturdy it's surely not hurricane proof. 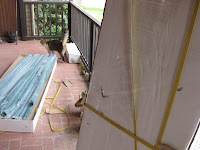 This greenhouse has an aluminum frame with plastic joints which highly disappoints me as the plastic will be the first thing to break and being at the joints it will cause a lot of problems; As well, there were many inconsistencies in the building materials but nothing that we couldn't work around. The construction was at times frustrating but it only took about 12 hours of work (with two people). To allow for easier watering we installed a water line in the greenhouse with a water spigot and hose. We put down some sand on the interior floor before laying brick pavers. The brick pavers will hopefully prevent anything from coming up from the ground such as weeds and bugs and provide a clean work area. They should also absorb a little heat cooling things off a bit. How do you know if a greenhouse is a good buy? For starters, if you are buying a greenhouse kit, I would only recommend buying one with double walled polycarbonate panels or glass. The panels are rigid, durable, efficient and a lot cheaper than glass and can also insulate the greenhouse protecting it from cold temperatures. I have seen cheap knock off greenhouses for a few hundred dollars that are made with single walled plastic panels, these are no more than toys and you should expect them to be extremely low quality. 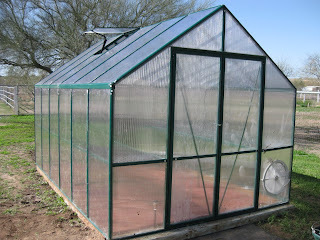 Go for a greenhouse made with a metal frame, a plastic frame is very short lived. As far as extra features make sure you buy a greenhouse with vents and preferably automatic vents. These automatic vents are levers with a bee's wax cylinder and a piston. When the air in the greenhouse gets too hot the bee's wax will melt, force the piston out, and open the vent. Fans are also a good idea to circulate the air and cool things off a bit. So how does one go about assembling a greenhouse kit? By reading the manual of course. First thing is first, create a method to sort your parts. I organized parts by what step they would be used in according to the manual. Also, I would not recommend building on hard surfaces such as concrete, asphalt, rocks, or dirt. Such surfaces can get excessively hot and actually melt the panels, in addition they can create scratches and dents in your frame. I built mine on grass, however my lawn is rather uneven and this made things a little more difficult. The sides can be constructed by a single person but as you build the roof you will definitely need at least two people and a step stool. Depending on where you live and what you are growing both temperature and humidity are crucial factors to growing healthy plants. If either temperature or humidity are too high or too low then the plants can be threatened. In my case I grow a lot of tropical plants which need high humidity (a minimum of 60%) and warm temperatures (65 F - 95 F). In Arizona we have a lot heat but no humidity. For the desert greenhouse gardener this is good and bad. Bad because its easy to overheat things in a greenhouse even with vents and fans especially when the outside temperature is +105F. Good because you have to worry less about excessively cold winter temperatures and high electricity bills. It is typically warmer inside a greenhouse than outside of one which causes problems of overheating in the summer. This can be combated by using a combination of shade mesh, thermal mass, and air circulation. A shade cloth/mesh will probably work the best as it can lower the inside temperature of a greenhouse from 140F to 100F in just minutes. Different gauges of mesh are available to allow for less light or more light thus controlling the inside temperatures. For those with high heat and low humidity a swamp cooler in addition to the shade mesh is ideal. Winter for most greenhouse gardeners is the most difficult time of the year, and usually heating elements such as space heaters or propane heaters are required to keep the plants from freezing. An economical way to keep the temperature up in the winter is to install bubble wrap on the interior of the greenhouse. This provides temporary insulation and reduces you heating requirements. Luckily humidity is one of the easier things to control in a greenhouse. To achieve more humidity you can install a fish pond or misters. Also the more plants you have the more humidity will be in the greenhouse as plants perspire water into the air. To release humidity simply open some vents or open the greenhouse doors. So how do you find out how much humidity is in your greenhouse? You will need a Hygrometer, these are typically inexpensive and there are some digital hygrometer/thermometer devices that can be placed on the wall inside a greenhouse. But of all the greenhouse gadgets a thermometer is the most important. Be sure to check it constantly during the first couple weeks of having a new greenhouse. Find out what your nightly lows and daily highs are to make sure that you can keep all of your plants happy before you introduce them into their new home. Water's high specific heat allows it to absorb heat energy very effectively. By placing large 35-55 Gallon drums filled with water inside your greenhouse you will be reducing the maximum temperatures and increasing the minimum temperatures. The concept is simple, during the day the water absorbs heat from the greenhouse reducing the temperature and at night when the temperatures drop the energy stored in the water is released to the greenhouse thus slightly increasing nightly temperatures. To make the process more effective all drums should be painted black to absorb the maximum amount of heat. Plants need light to conduct photosynthesis and create crucial sugars for survival and growth; however all plants require different amounts of light. A sure fire sign of insufficient light is elongation of stems. You will notice this most on fast growing plants such as beans. If you want to try it yourself, plant some beans in a pot inside your house. Because there are low light levels inside of houses you will see the stem grow towards any windows looking for more light. Generally this isn't much of an issue as most plants are well adapted in partial shade to full sun. Some plants however, especially sensitive ones like orchids, are very specific about lighting requirements. If you think your plants might be getting too much or too little light, meters are available to measure the foot-candles (foot-candles are a measurement of light intensity). Adjust your shade accordingly or look into buying interior grow lights if more light is needed. Always be weary of what you are putting into your greenhouse. The introduction of a plant that is infected with aphids, for instance, would jeopardize all other plants. In closed environments such as a greenhouse bugs and diseases can spread rapidly. If you have plants that are infected with a fungus or bugs try using an organic insecticidal/fungicidal soap prior to bringing the plants into the greenhouse. Also be careful of what organic materials you bring in; Compost that isn't completely broken down may still contain foreign seeds or bugs that will readily conquer your greenhouse. Check compost and mulch for small bugs such as gnats before bringing it inside. For many people greenhouses are for the starting of crops or ornamental plants during the winter for introduction to the garden/yard in the spring. This allows for a head start to gorgeous landscapes and early harvests. For others greenhouses serve as permanent utilities for food production; Most commonly people will grow tomatoes year round with stunning success. Don't feel limited to the average plants however, try something new and exotic to add some variety to your growing space. Bananas are probably one of the better suited plants, although there are hundreds of edible tropical plants that you can grow in your greenhouse, so be adventurous. Just because you grow plants that may be used for food or ornamental purposes , don't automatically associate your greenhouse with "work". Greenhouses are fun places to relax, read a book, and escape from the world. Most importantly, enjoy the rewards your greenhouse will offer, savor the fruits and vegetables all year long.